Optoma’s new 4k 5,000 lumen projector, the 4K500, is now starting to ship. We took a few hours to do some quick comparisons and check out the image quality – before this one was needed for a university science classroom (we really appreciate their willingness to let us have this first peek!). To put things in perspective, up until now 4k projectors have been either very, very, expensive (in the $50-$60K range), or very low brightness for home theater applications (in the 1,300 to 2,000 lumen range). Even then, 4k projectors under 2,000 lumens, until recently, have started in the $7,999 range – so you can imagine our excitement when this 4K UHD-capable projector was announced at under $7,000 with 5,000 lumens of light output. The Optoma 4K500, understandably larger and heavier than the Optoma UHD65, is on the right. Since we had just finished doing some comparisons with Optoma’s new UHD65 projector (see previous blogs and videos), we thought this might be the best way we could see how its new big brother compared – and we were especially interested in the color and brightness. Since they both use the new DLP chip from Texas Instruments, but are designed for very different applications, we expected to see some significant differences. We did see some of those differences – but we also saw a couple of things we were not expecting to see. As we would expect, there was a significant difference in brightness, or the overall intensity of the image. One of the questions we had was if this extra brightness could be used to more-fully capture the HDR (High Dynamic Range) capability of the new 4K HDR Blu-ray images. The other area of interest was the color gamut and the expanded capability of the new discs in terms of reproduction. 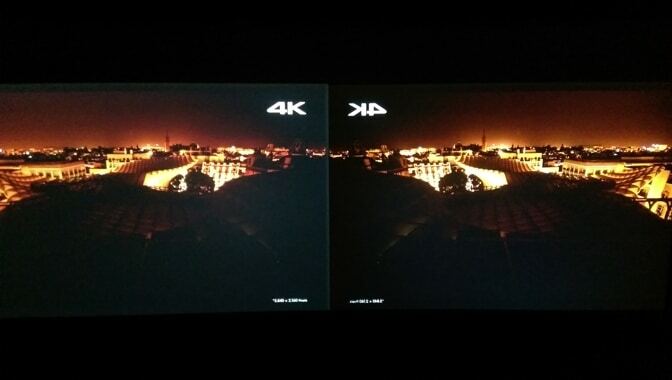 This first image shows the projectors side by side with the 4K500 in its “Presentation” mode, which is the brightest mode, before the whites and other colors begin to really show the extra green in the image. 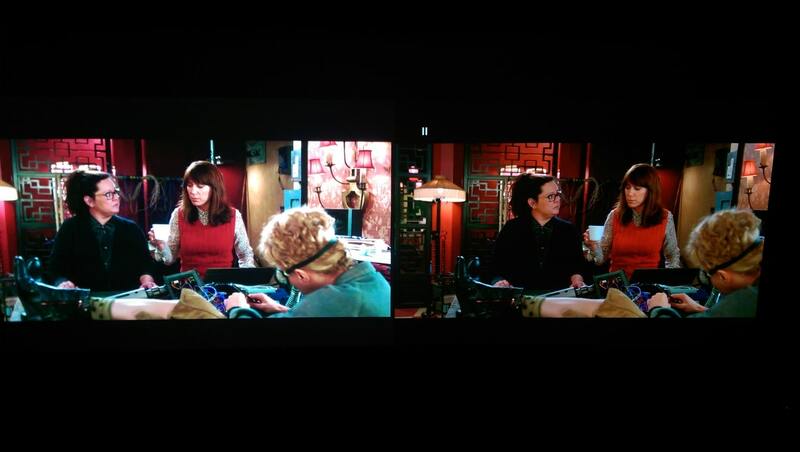 The Optoma 4K500 in “Presentation mode” is now on the left and the UHD65 is on the right. In the image above, the camera was set to expose the 4K500 so you could see the relative brightness difference between the two models. The UHD65 actually looked very good and bright in person but if we had exposed for its’s brightness the 4K500 would be almost washed out. Our eyes can somehow see both of these images live and expose properly but most cameras cannot. It’s part of what HDR is all about – but unfortunately we did not capture this in HDR and even if we did, the chances of you watching or reading about this on a UHD-capable monitor would be pretty slim. At this comparison size, of approximately 80″ diagonally, for each image, the brightness measured 74.2 foot candles vs 19.1 foot candles for the UHD65 which, as you can see from the camera image is quite significant. This kind of brightness is exactly what you need in a classroom, museum or other environment – which has a higher level of ambient light than a dark home theater environment. Keep in mind the “Presentation” mode above is not the projector’s brightest mode. But, like most projectors, the brightest mode is not very pleasing for skin tones, nor has a level of color accuracy that most people would consider acceptable. The bottom line is that as far as brightness goes – yes, the 4K500 is significantly brighter, as we would expect, than the UHD65. To better understand HDR( High Dynamic Range) and why it is becoming so important, just hold your phone camera up to a window on a normal bright day and have someone stand in front of the window. What you will see in the camera will either expose for the outside and the person will be a silhouette or the person will be exposed properly and the outside will be just a blown out white area. Getting closer to what the eye can do (our eyes can simultaneously expose both the outside and inside person perfectly) is what HDR is all about. It is also all about expanded color – but we’ll address that in the next section. Both the UHD65 and the 4K500 have HDR capability however, to really give HDR its proper capability you really need to have a higher level of brightness than what most current home theater projectors can do – which is why we’re interested in this much brighter projector with HDR. With the capability of 5,000 lumens (closer to 3,600 with more accurate color settings) we were interested to see just how well it did with HDR content. 4K HDR content with camera exposure set in between the two projectors to show relative difference. In the above image, taken off-screen, the 4K500, which is on the left, is slightly overexposed but shows the relative difference in intensity over the UHD65. No question it had the brighter highlights – but it did so by slightly sacrificing both color accuracy and deep blacks – as we would expect in this level of brightness. This extra brightness would allow for much larger screens than are typical in home theaters, and/or the use in applications where there is some ambient light in the room. In a room with some ambient light, the extra brightness would be a significant advantage. For the die-hard home theater enthusiast who watches movies in a controlled darkened room, the better blacks and more accurate color of the UHD65 would make more sense because of the slight advantage of the HDR where color and blacks are not sacrificed for brightness. Both projectors have their place in the right application – applications which are very different. It is also important to note that in looking at these images online they are different than seeing them in person. Just like the phone camera in front of the window cannot simultaneously capture both exposures, neither can most cameras capture just how the above comparison really looks. This is partly because of its lack of HDR capture and playback but also because the camera’s lack of ability to capture the two different types of color generated as the eye sees them. In person, the skin tones above are both exposed properly, and the differences in skin tone are much less pronounced. The image on the left looks brighter, but the lack of deep blacks still makes our eyes keep going back to the image on the right. 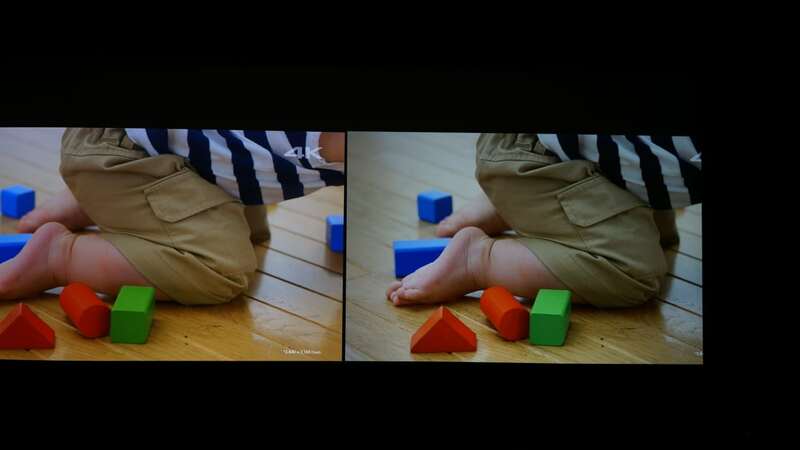 One of the great capabilities of the HDR technology is the expanded color gamut of BT2020. The BT2020 color space has a much greater range of color than what has been previously available on electronic displays. It is so much wider in fact, that very few displays can even approach 90% of it, and those will usually only be those which use lasers or LEDs as a light source. Think of the deepest red velvet or red red rose, along with deeper greens and blues – this is what BT2020 is striving to achieve. When expanded color is combined with expanded dynamic range (think of the phone camera vs. the human eye), you can see why there is so much interest in 4K HDR. When it is done well it is very captivating and exciting to see. In the case of Optoma’s 4K500 we did not expect to see a level of expanded color gamut in this bright of a model. Why? Usually as the brightness level goes up, in a business class projector’s color, accuracy goes down. In this projector we were pleasantly surprised! The colors looked very good for this brightness class of projectors – better in fact, than most 5,000 lumen DLP projectors under $7,000. I have seen a few projectors in this brightness range with dual color lasers, and some very high end simulator projectors with RGB/RGB color wheels – but they are thousands of dollars more, and not 4K or HDR capable.This is truly a new class of projector. How close does it come to BT2020? Comparing it to Sony Triluminous color, I would say that they are very close to DCI P3, and probably in the 75 to 80% range of the 2020. When they are available for a longer period of time we’ll know exactly – but the color was a very pleasant surprise. Keep in mind, when the specification sheet says “compatible with BT.2020” that is not the same thing as actually having BT.2020. They are talking about the color they can do, and just remapping it to work inside the BT.2020 color space. 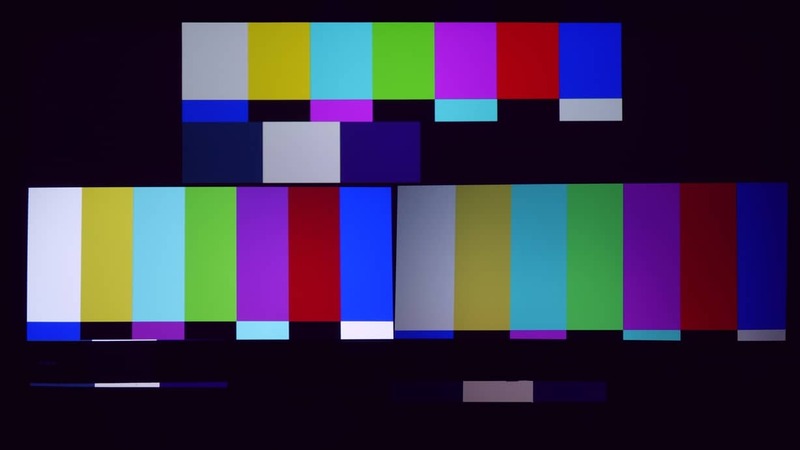 In any case, in a bright environment or on a large screen, the color was very exciting to see. Sony Triluminos (VPL-VW365ES) expanded color on top, the Optoma 4K500 color on left, and BT.709 shown on the Optoma UHD65 on right. Notice the very deep red, vivid blue, and bright yellow of the 4K500. Even though the standard color bars are BT.709, the color space for standard HD, they can give you an idea of how well a projector’s color capability is. We hope that there will be a 4K HDR test signal Blu-ray soon that will help show the full BT.2020 color. Below is skin tone from 4K content. This content source is not in HDR, so the color here is mainly to show how well it competes with the RGB/RGB color system of the UHD65. The 4K500 overall brightness was turned down so color could be better compared in this photo image. Vivid, saturated, and very accurate color even when compared to the RGB/RGB UHD65 color on the right. Again, like HDR and color temperature differences, the camera image shows a little more different than what we saw with our eyes – but it gives you an idea of how good the 4K500 color really is. We expected the 4K500 to be like a bright version of the UHD60, but in terms of color it is more like the UHD65. The 4K500 also has a full suite of the “Pure Engine” image processing tools like the UHD65. However, for these comparisons, they were all in the ‘off’ settings. Color saturation, motion blur, and a version of dynamic black can be adjusted in the Pure Engine section of the menu. In our opinion, it is the blacks and accurate color that really separate the very best of the home theater projectors. Since the 4K500 is not a home theater but a commercial and educational classroom projector, (and at four times the brightness of many home theater projectors), it was no surprise to see the black levels at a much higher level than the UHD65 and many of the home theater projectors that cost over $2,000. Part of it is just simple physics: with more light comes more light scatter and internal light engine reflections, and thus higher black levels. This projector is no exception. However, there is always hope, and we did not know if there was an internal iris or some new technology that somehow breaks the rules and gives us the best of both worlds. This is clearly not the case, as we did see the elevated black levels as we would expect. Very good for a business class projector – especially in this brightness range, but not so good for a home theater application in a dark room. Black level comparison shot off screen in a dark home theater environment. The 4K500 was put in the low lamp mode and in the “Cinema” color setting in order to expose both images side by side without overexposing or underexposing either image. Black levels will rise with lamp settings and also with color modes as more light is pushed through the projector. For those who thought the 4K500 would be a consideration for a high output HDR projector for use in a dark environment, the level of blacks and the depth and apparent detail that it can add to the image would need to be taken into consideration. For use in normal room lighting, or even in a moderately lit area, the blacks would not be a major consideration; in those applications brightness, color, and sharpness will win every time. 4K UHD, if done properly, can be spectacular to view. The detail and sharpness of this projector is excellent. 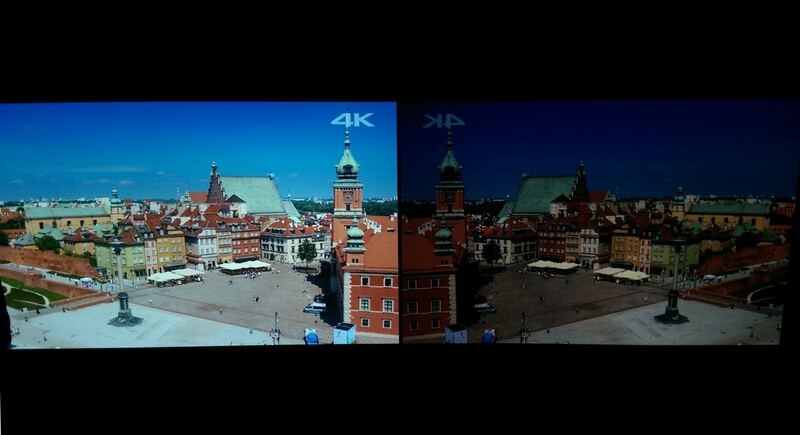 There are many debates going on about how any kind of pixel shift is not true 4K UHD. We are very aware of all the major technologies and each of their shortcomings. 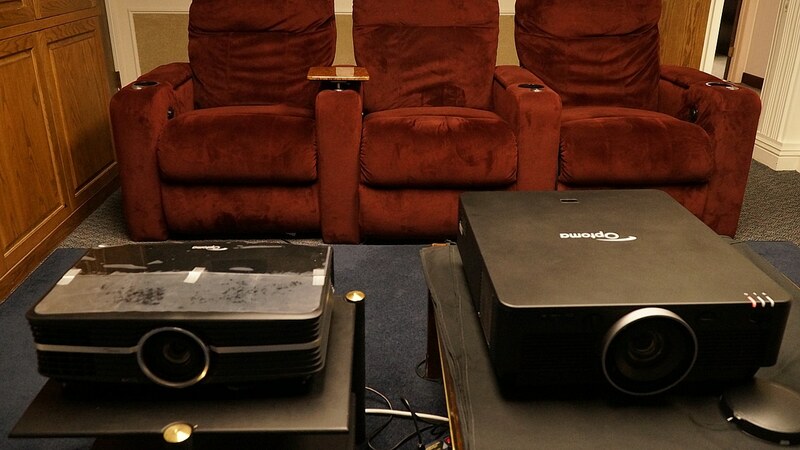 We have also done extensive side by side comparisons to true “native” 4K projectors. Without question, when it comes to detail and sharpness in 4K, this projector can keep up with the best of them. How is that possible? Texas Instruments claims they are able to individually address all 8.3 million pixels using an “optical actuator” and with a single imager in the projector so there is no misalignment of multiple imaging chips. In any case, we suggest always asking for a live side-by-side comparison if you are deciding between projectors so you can see for yourself. 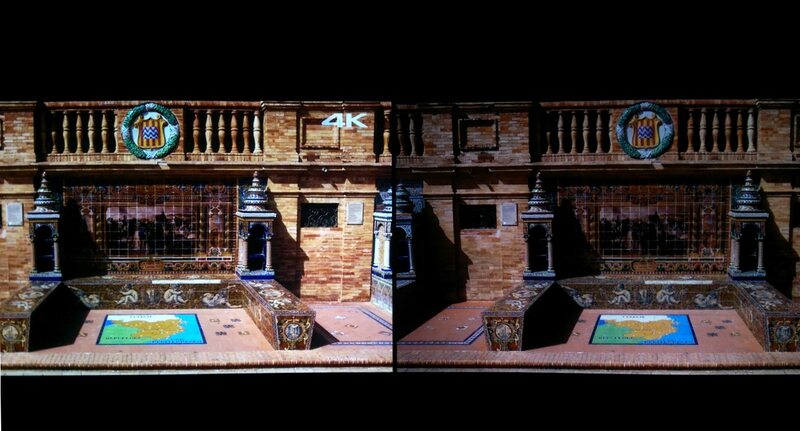 Excellent detail and sharpness even when compared to the UHD65 on the right which equals or exceeds most of the 4K UHD projectors with pixel shift or native 4K UHD projectors. Imagine a command and control center with large 150″ images where even the smallest text and detail can be discerned. Imagine a conference room where four full resolution HD laptops can be displayed simultaneously. The Optoma 4K500 marks the beginning of a new class of 4K projector for cost & performance in professional, educational, government, and business applications. The previous cost for a 4K UHD projector was $50,000 or more; this projector is now under $7,000 – well within the reach of many of these applications. We expected good detail and brightness; what we did not expect was the very good color quality for this class of projector and the very-capable motorized zoom lens. For applications where some ambient light is present, or where larger screens are needed in dark environments, this projector should be considered as a strong possibility. This entry was posted in AV Solutions, Home Theater and tagged 4k, 4k projector, 4k uhd projector, 4k500, 4K500 comparison, 4K500 projector review, 4K500 review, business projector, classroom projector, optoma 4K500, Optoma UHD65, projector comparison, projector review, UHD, uhd projector, VPL-VW365ES.